Actually has a lot of utility. 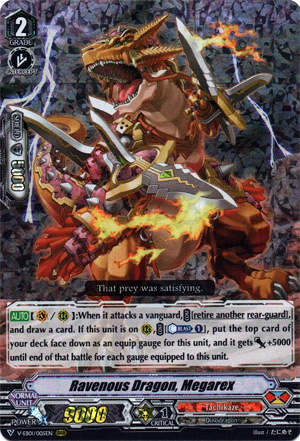 And to be honest, assuming Gigarex is the main ride this is your deck’s workhorse if you can’t score Deathrex. Gigarex on Vanguard circle turns a Skyptero into a hit and runner. On RG circle it’s what’s going to be retiring all those Blightops and Skyptero to ensure you get +1s for all your self-retiring. It also has the extra bonus of gaining Equip Gauge but let’s be honest, that niche is filled by Gigarex already unless you need to specifically retire Megarex for whatever goddamn reason. Much like Spike Bouncer, this is a must-have.